A long lost cult-classic makes its anamorphic widescreen DVD debut from Synapse Films! An airplane goes down in the ocean during a storm and the few survivors find refuge on a small tour boat. Swept out to sea, these people slowly starve to death in the hot sun with barely any food or clean water. 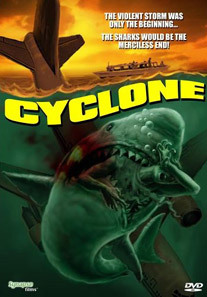 With no place to turn, the boat survivors resort to cannibalism to stay alive‚ that is‚ until the rescue planes come to pick them up and the man eating sharks decide it‚ s time to eat, too! This gory, exploitation film was directed by Rene Cardona, Jr. (TINTORERA, GUYANA: CULT OF THE DAMNED) and is presented in a beautiful new anamorphic widescreen transfer from original vault materials.